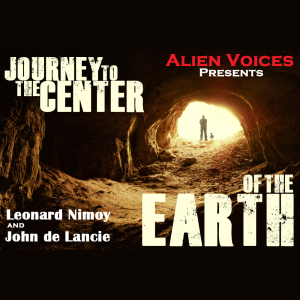 An Audio Drama production based on the novel “Journey To The Center Of The Earth” by Jules Verne. The story involves a professor who believes there are volcanic tubes going toward the center of the Earth. He will embark on a journey together with his nephew and their guide, where they will encounter many adventures, including prehistoric animals and natural hazards, and eventually coming to the surface again in southern Italy. Featuring Susan Bay, Roxann Dawson, Richard Doyle, Robert Ellenstein and Marnie Mosiman. With Owen de Lancie, Andrew Robinson and Armin Shimerman. Journey To The Center Of The Earth was produced by Alien Voices, incorporated.